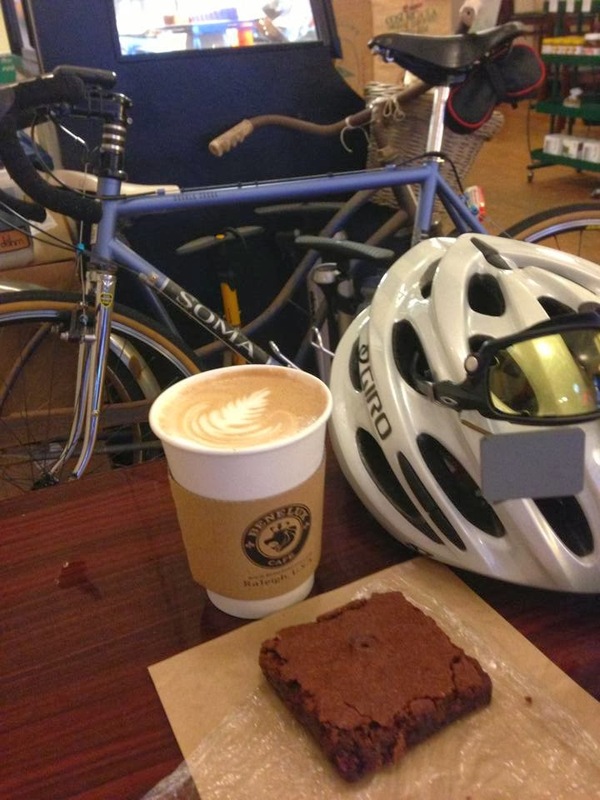 Some of you may remember my post about last year's Coffeeneuring Challenge... well, I did it again this year! 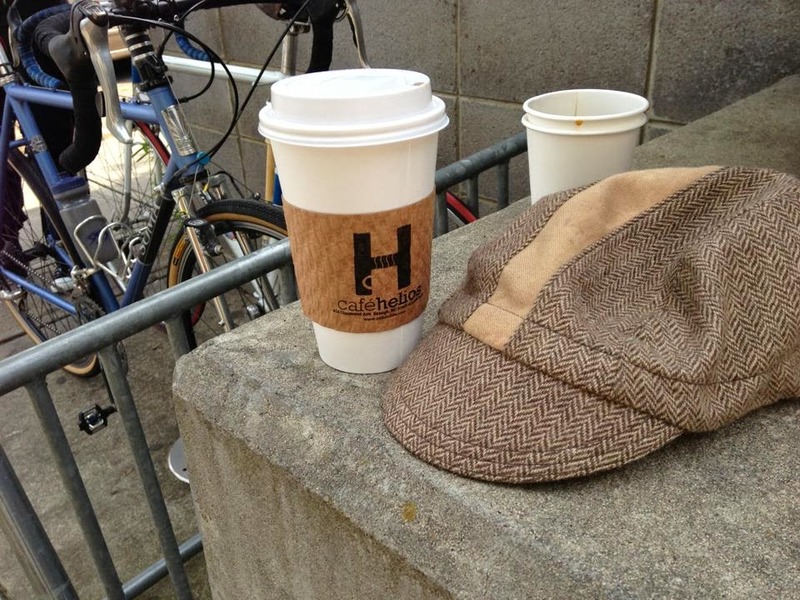 You can read all about the history and rules of the Third Annual Coffeeneuring Challenge over at Chasing Mailboxes DC. Last year I had a blast, all my rides were as they should be- casual jaunts to explore and find new roads, new coffee shops, and new reasons to throw a leg over the bike and go get caffeinated! This year I ran into scheduling issues... My work schedule is decidedly not traditional- part time retail has me working most Saturdays, and my usual days off of Sun, Mon, and Tues can frequently get booked up with photography jobs. This is a good thing for my ability to afford bikes & coffee, but gets in the way when I just want to ride a bike to a coffee shop. I managed to work it out, but I will say this- though I technically completed the challenge this year, last year's was way more satisfying. Next year I'll have to try something different like all "coffee shops without walls..."
I decided that Sunday and Monday should be my "weekend" for the challenge. I wanted to try for 7 shops other than the 7 that I visited last year, and of course no Starbucks or other chain stores. I only got 4 new stores, the other 3 were repeats from last year. Coffeeneuring #1- Benelux Cafe, Monday October 7th. 17.5 miles. Benelux Cafe is one of my favorite coffee shops of all time. I visited it for last year's challenge, but I was craving a mocha and one of their brownies so I started this year's challenge with Benelux. Oh well, there went the idea of no repeats from last year. Good to get it out of the way... I rode the new Soma Doublecross- this bike is perfect for coffeeneuring, randonneuring, commuting, and with a quick wheel change- playing in the dirt, too! Coffeeneuring #2- Common Grounds Coffee, Sunday Oct. 20th. 14 miles. After week #1 I wasn't able to do a coffeeneuring run on week#2. Instead I rode the Bicycle For Life 1000K. I thought about a short coffee run the day after the ride, but that would've meant making a Tuesday exception and also I simply could not bear to sit on a bike saddle again, so I passed! The next weekend I rode a fantastic 50 miler at the North Carolina Bicycle Club Fall Rally and planned a short coffee run for after the ride. I rode my classic Ciocc San Cristobal and had no bike computer, so for the coffeeneuring run I used my iPhone. The Rally ended at CBC in Holly Springs, so I thought it would be a nice easy ride over to Apex to check out a new-to-me coffee house called Common Grounds. Little did I know that NC HWY 55 Bypass had been turned into a "Superstreet." If you're unfamiliar with this concept, you should check it out- these monstrosities are nearly impossible to navigate on a bicycle and totally impossible for pedestrians. This one cuts the town of Holly Springs in half and there's no way to cross it safely. On the bright side, Common Grounds is an excellent little shop- almost worth risking my life to get there. Almost... I had their mocha, perhaps if I'd added one of the tempting baked goods it would've been totally worth it. 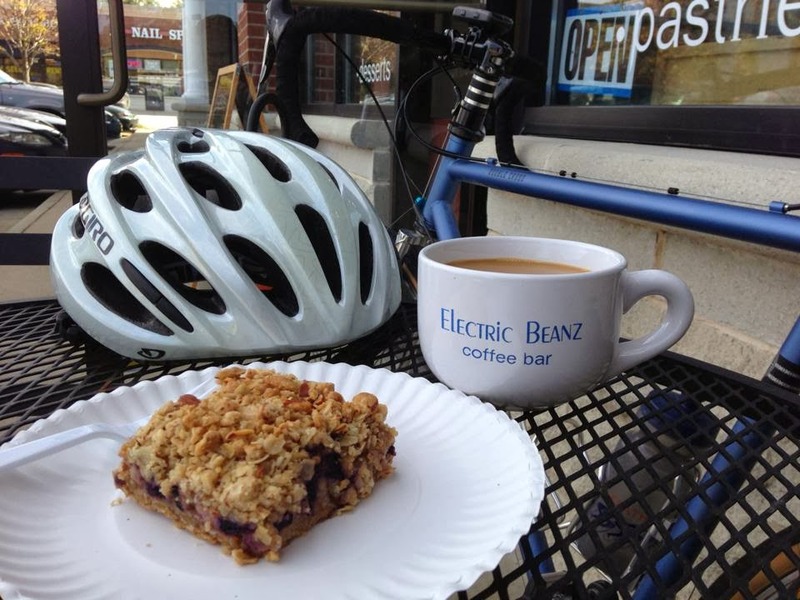 Coffeeneuring #3- Electric Beanz Coffee Bar, Monday October 21st. 12 miles. The day after the Fall Rally I had a real day off from work and/or Randonneuring. Electric Beanz is a new-to-me coffee shop not too far from home, though heading a direction I usually don't ride and on some busy roads to boot. Still, the website looked enticing so I rode over and was suitably impressed. I had a pour over brew of their dark "Cowboy Roast" and a blueberry bar. I'm actually drooling just a bit as I type this. Perhaps I'll drop by there tomorrow... Rode the Soma again, I'm really liking this smooth ride! 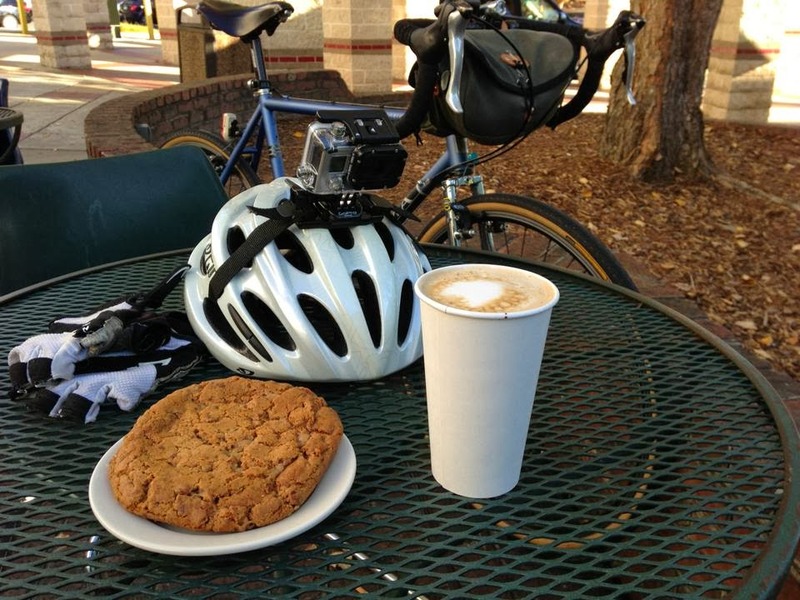 This was coffeeneuring at it's best. I found a great little shop and had a nice, relaxing recovery ride. 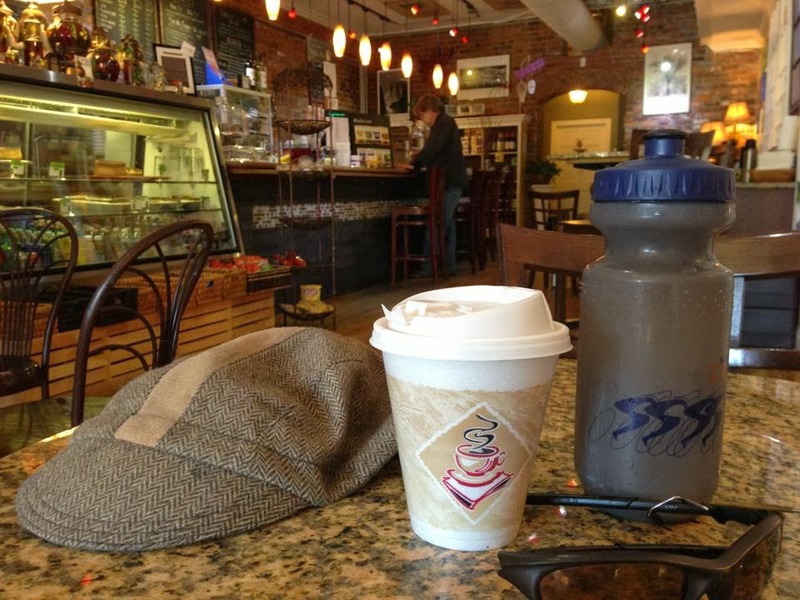 Coffeeneuring #4- Cafe Helios, Sunday October 27th, 2.6 miles! The next Sunday I went to the Oak City Cycling Project's Frankenbike Bike Swap. I set up a table and laid out a bunch of stuff I had just hanging around in boxes. Didn't sell much, but I bought a few things. I think I left about $30 in the hole... Oh well! Afterward Geof and I rode over to Helios and I had a medium coffee. Another ride on the Soma, but this one was so short... I just didn't want to miss the bike swap and this technically met the coffeneuring rules. Monday the 28th I had a photo shoot so no coffee ride. The following Sunday I did a 200K permanent with some friends that finished in downtown Raleigh. I had another shoot that Monday the 4th of Nov. so I knew I needed to get a coffeneuring run in after the permanent. I decided to bike home from the finish and stop for coffee along the way at Morning Times Cafe in downtown Raleigh. This is a shop I visited during last year's challenge, and also one I frequent since it's right near the end of my bike commute to work. I just had a quick cup of coffee and took a snapshot. 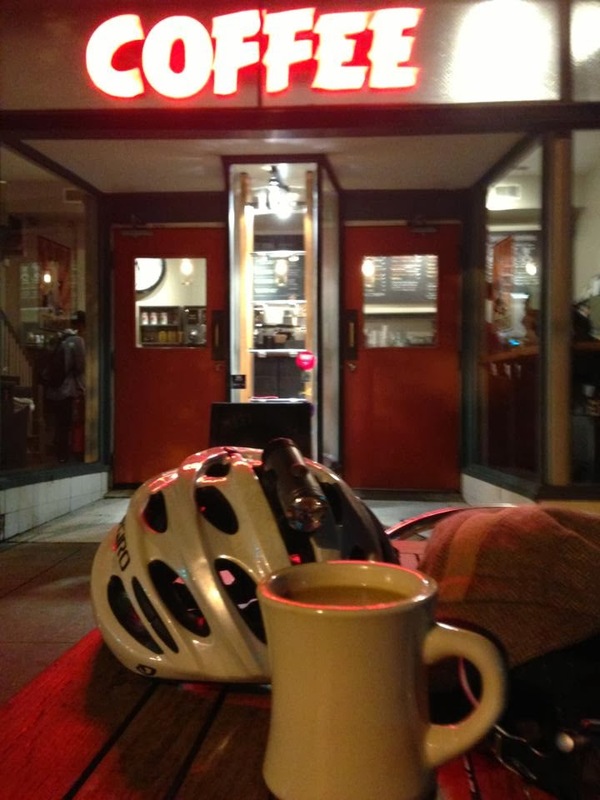 Now that the time's changed a 200K tends to finish up at or after sunset... Coffeeneuring at night! It turned out that my photo shoot on Monday didn't start until 11am, so to keep up with the challenge I got up early and rode a lap around Garner, stopping at my favorite local shop along the way. I visited Aversboro Coffee during last year's challenge as well, so once again here I was technically within the rules, but not exploring and finding new coffee shops. I had my usual medium coffee and started the photo shoot well caffeinated. The following Sunday I had a shoot and one was also scheduled for Monday the 11th, so it was looking like I would be right down to the wire this year but my Monday job got rescheduled. I decided to explore some of Raleigh's greenway system and head over to Mission Valley to Cup A Joe. I visited the Cup A Joe over on Hillsborough St. last year, but this one counts as a new coffee shop. I had a mocha and a huge cookie, and the GoPro timelapse makes me look really fast. Wish I could get through controls on brevets this quick! The greenways were ok, but my problem is that they just don't seem to go anywhere. They were obviously designed as workout trails and not as transportation routes. Occasionally they will just end at a street with no signage telling you where to go to pick up the trail again. Along Western Blvd (the busiest road on my route) the greenway would conflict with intersections so it just meanders away from the road, intersects with a side street and ends. According to the map it was supposed to run all the way up Western, but no such luck. I finally gave up and rode the big paved trail with the double yellow lines and the clear signage. Even with the disappointing greenway system I enjoyed this ride, because I was exploring on my bike and getting coffee at a new shop. So that's it! 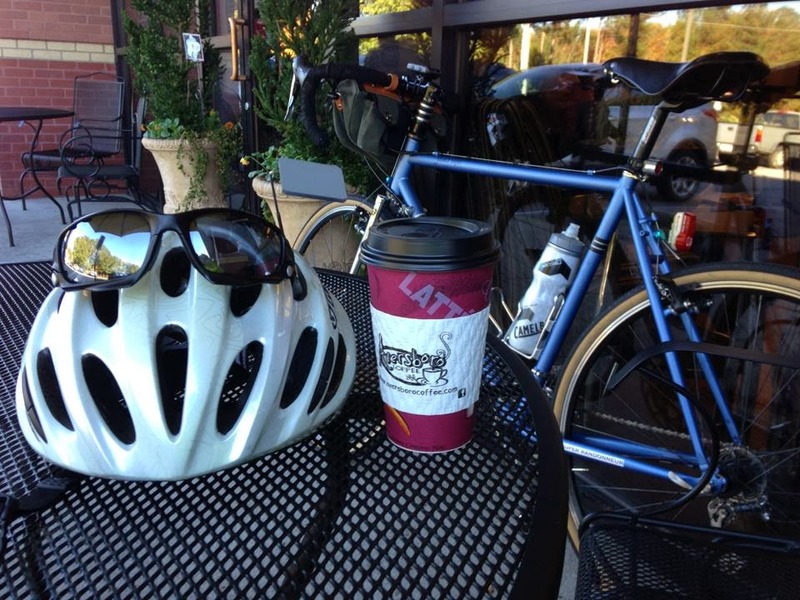 Another Coffeeneuring Challenge in the books. Like I said in the beginning, I had a lot more fun with it last year. I'm very happy to be complaining about being busy with too much work, so that offsets any disappointment I had with my coffeeneuring this year. Next year I'd like to do something fun. Maybe a Coffeeneuring Team?!? All coffee shops without walls?!? Hmmm... I've got some time to think it over.